Is university capitalized? It’s not a simple yes or no, unfortunately. There are instances when one is required to capitalize the word “university” while in others, a lowercase is required. Without further ado, let’s get to the distinctions. When used as a proper noun such as “Univesity of Virginia” or “Oxford University,” then the university is capitalized. It has a physical presence and can be seen, visited and addressed. As such, it is a proper noun, which requires capitalization according to the conventions of grammar. Note that the term ‘University’ has been used twice in the sentence above. In the first instance, it appears within a proper noun. However, in the second, it is used alone. Since we already are aware which university is being talked about, then the word is still capitalized as It pertains to a specific institution. When is University not capitalized? If you are talking about a university in general, then it becomes a common noun and is hence not subject to capitalization. Common nouns are generic names that offer no specificity. If we. say: “Going to university is an ideal dream to many people.” Then “University” becomes generic. Nobody knows which exact university we are talking about. Grammatically, any common noun should be written in a lower-case-format. When it comes to the term “University,” the key aspects to consider are proper or common. If it appears as a common noun, then do not capitalize. However, if it demonstrates the properties of a proper noun such as identity and specificity, then, by all means, do capitalize. To learn more about proper title capitalization rules, give our free title capitalization tool a try. Next articleIs Presidents’ Day Capitalized? 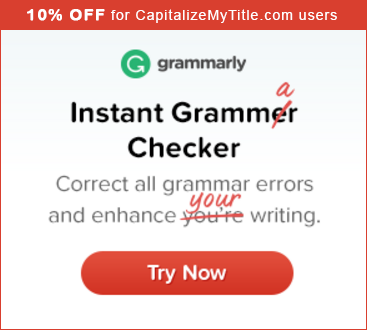 CapitalizeMyTitle.com is a participant in the Amazon Services LLC Associates Program, an affiliate advertising program – it is designed to provide an aid for the websites in earning an advertisement fee – by means of advertising and linking to Amazon.com products. Amazon and the Amazon logo are trademarks of Amazon.com, Inc. or its affiliates.